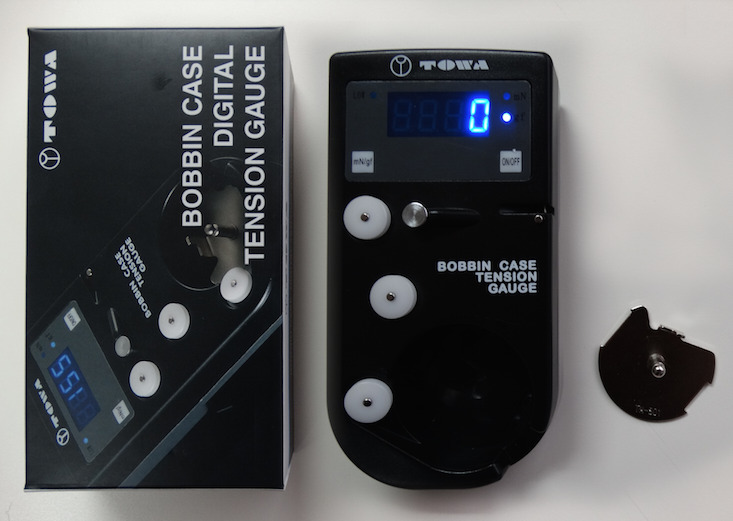 This digital tension gauge is easy to operate, measures both bobbin and top thread tension, offers a low battery warning and will go into “sleep” mode if left alone for 50 seconds. If left alone for five minutes, it will turn itself off. It operates by simply wrapping thread around a system of pulleys, which read the tension produced when pulled against the top thread that is in your machine, or when a bobbin case is dropped in to the unit, pulling the bobbin thread through the system of pulleys. L Style bobbin case insert. The numbers above are intended to be used as a guideline and may need to be adjusted up or down depending upon your specific machine. Be sure to set your gauge to the gf (gram force) setting by using the toggle button in the upper right corner of your gauge.